A couple of weeks back I was pleased to buy a copy of Delia Smith’s updated and revised Cake book. I had not got a copy of her original “Book of Cakes” that was the forerunner to this book. I wanted to put that right as I am a huge Delia fan and her recipes helped me to bag my husband (or I like to think so!) nearly 17 years ago. I don’t really make a lot of Delia’s sweet recipes so it was going to be a new experience trying her cake recipes out. She is known for her fail safe recipes which are known to work so I wanted to try out a cake recipe which would double up as a pudding to go along with Sunday lunch. 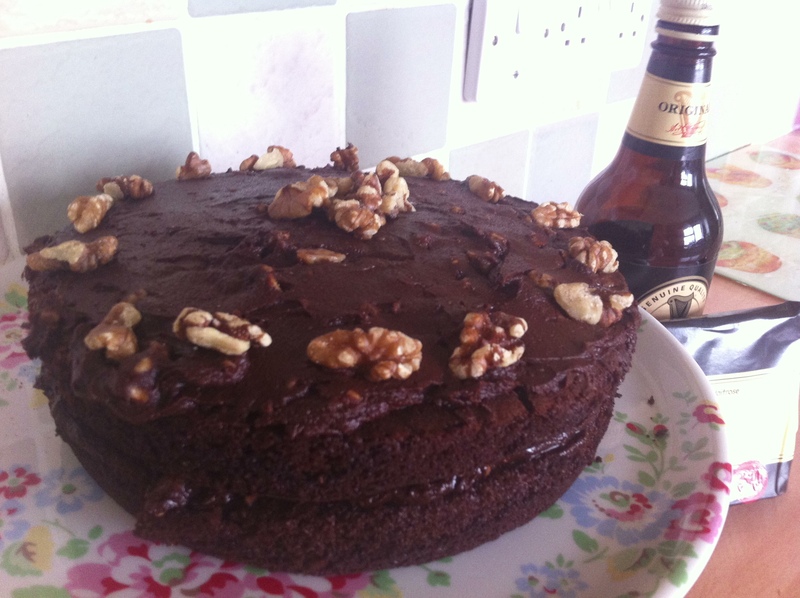 As it was St Patrick’s Day I chose to bake Delia’s Chocolate and Beer cake. The beer in question would be stout, so of course I chose Guinness. I don’t really drink beer that much, if I do it’s usually in the pub or in the summer at a bbq. I have more wine, really. The same goes for my hubby. We just don’t really buy it unless we have parties or bbq’s. I had to buy in a special bottle of Guinness to bake the cake and thankfully there would be enough to have a half a pint afterwards! Pour it out! My hubby had offered to cook the dinner but I would get the pudding sorted out first. It was a simple chocolate sponge sandwich with the delicious addition of the stout in both the cake and in the icing. While the oven was preheating, I greased and lined two 8″ sandwich tins with baking parchment circles. All the dry ingredients were sifted together into a big mixing bowl. As I did this I managed to make a right old mess with the cocoa powder, it decided to sprinkle everywhere. It went on my book, all over the surface and even on my hands. I can’t understand why I did it. The same went for when the whole of the cake batter had been mixed together. It was so frustrating. Perhaps it was because I was rushing, wanting to get the cake in the oven and baked quickly. 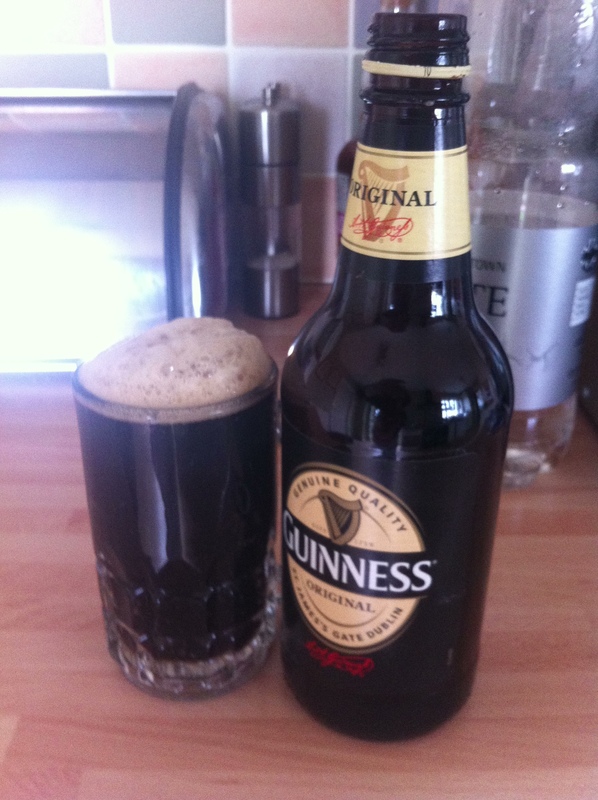 All the ingredients were simply added to the dry sifted ones, with the Guinness being added slowly afterwards. The cakes were baked in my oven on the central rack for about 30 minutes. While they were baking I started on the chocolate icing. This too contained Guinnesss but only 2 tablespoons of it along with melted dark chocolate, butter and icing sugar. It combined together smoothly. My only concern was that there didn’t seem to be enough of it. Maybe I do overdo it, or I’d put too much in the filling and not on top. The final touch was some walnut halves on the top of the cake. I would have liked to have added some sugarpaste shamrock shapes but I had no green sugarpaste handy. So walnuts it was, then. When the cake was finished and brought to the table at dessert time everyone was keen to try a small piece and it went down really well with a scoop of vanilla ice cream on the side of it. I really enjoyed my piece of cake even though I’m meant to be cutting down on sweet things and it was really hard not to get the knife out to cut another slice. The Guinness was a great compliment with the chocolate and wasn’t an overpowering taste at all. We all loved it! There was enough Guinness left over for my hubby to have half a pint before lunch! The gorgeously moreish Chocolate and Guinness Cake- recipe from Delia Smith’s new Cake book. Next Post Spring Baking from The Clandestine Cake Club Cookbook.